There has been a pointed lack of thrash tinged black metal in my life. The thing is the truly evil stuff has always captured my imagination and big burly riffs that accentuate ungodly vocals make for a beautiful and life changing combination. The fact of the matter is that Aversion have been able to invoke the old masters on their self titled debut whilst simultaneously finding their own place in a crowded scene. A delicious mix of old and new these guys prove that good things can come from Canada! The blazing ferocity of the guitars strikes you from the first. Sure not all the melodic lines are at 100% but honestly that just adds to the punky magic some of these songs have. The raw anger and corpse painted oppression that provides a delicious veneer to Aversion is also what keeps the record from fading to oblivion. Though Aversion may play off old tropes they are able to keep them fresh by constantly invoking tasty new ideas and remembering exactly what made us fall so deeply in love with their musical ancestors in the first place. 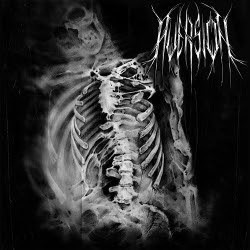 It essentially means that Aversion is a sort of modern old school black metal release. Aversion conjure up profound emotions and there is something deeply meditative about many of their tracks, despite the unchecked aggression that defines so much of the music. You hear these guys roaring forth with speedy riffs whose might should not be underestimated. The fact of the matter is that songs like Flesh of the Maggot prove that Aversion understand the unholy heart of black metal and they tear it out to present to the masses. In a world where bands like Kvelertak and Deafheaven are making us wonder what the genre can really be, Aversion show that the old ways still work wonders.